Shadow of the Fox. Julie Kagawa. Mythology/Young adult/Fantasy. 2018. 384 pages. 4 stars. The Dragon is rising, and another age comes to an end. When I heard of the premise of this book, I was really excited because I love mythology! I’m not well-versed in Japanese mythology, so going in this book was educational for me as it was fun. We follow the story of Yumeko and Tatsumi accompanied by other characters who are in no way overshadowed by the two! Yumeko is a kitsune with childlike behavior. It’s amazing how Julie Kagawa could capture the essence of a fox into a character because Yumeko played human and fox simultaneously without raising any doubts on my part. The mastery of her characterization is commendable and I’d like to take a moment to praise Julie Kagawa for doing that. On the opposite end of the character spectrum, is Tatsumi. If I didn’t know any better, I would say that Tatsumi would have been better off written as a robot. He was unemotional, highly logical, and seemed like he didn’t know how to have fun. His loyalty to his clan and mission is unquestionable. Duty above all, like a true samurai–and Kage demonslayer. His honor comes first, everything else follows. Both of their character backgrounds really support their characterization. It was spot on. They pick up a few characters along the way during their quest (which is why The Lunar Chronicles kept ringing at the back of my head while I was reading this book) like Okame and Daisuke. Daisuke is a morally ambiguous ronin. He provides a lot of the comic relief because he strays from what we stereotype as ronin. (A rōnin was a samurai without a lord or master during the feudal period of Japan. A samurai became masterless from the death or fall of his master, or after the loss of his master’s favor or privilege.) Okame is loud, he is obnoxious, he is transparent, and he is honestly the most lovable annoying character I have encountered. Daisuke, on the other hand, was the most surprising out of them all. I did not expect him to play a part of the story, but I’m thankful that he made the somewhat unofficial gang of the series! The story is very adventurous, covering a lot of places within its span of ~400 pages. Villages, capitals, forests, temples, you name it. The writing style makes it easy to visualize the scene. I appreciate that because that’s what I love about Asian narratives–the scenery, the stories behind them. Julie Kagawa also incorporates a lot of Japanese legends, culture, and myths into the story without becoming overbearing. It educates you but also fills you with wonder. It makes you appreciate Asian stories more. As you can see, Shadow of the Fox isn’t short of some humor as well. It’s constantly filled with light-hearted conversations that border humorous. Sometimes the humor can come off as trying to hard and may miss the mark, but I still appreciate how this story is well endowed with mythology but still manages to be funny and amusing. The book ends just as we feel like the story is beginning. I ate this book up and finished it within 48 hours. You can imagine my disappointment when I realized I had finished the book when I was just beginning to want more. Nonetheless, I loved reading this book and will be waiting on its sequel. 4 stars! 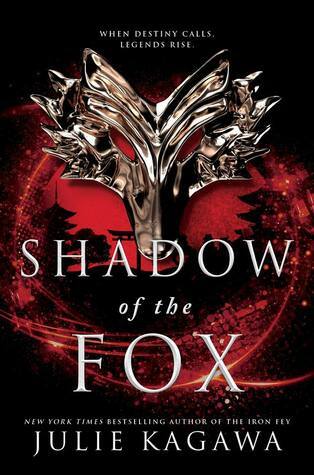 Shadow of the Fox is set to be released on October 2, 2018. You can pre-order using the buy links above! To pay the rent, Julie worked in different bookstores over the years, but discovered the managers frowned upon her reading the books she was supposed to be shelving. So she turned to her other passion: training animals. She worked as a professional dog trainer for several years, dodging Chihuahua bites and overly enthusiastic Labradors, until her first book sold and she stopped training to write full time. Julie now lives in Louisville, Kentucky, where the frequency of shark attacks are at an all time low. She lives with her husband, an obnoxious cat, an Australian Shepherd who is too smart for his own good, and a hyper-active Papillion. I cannot wait to read this book! Great review.